The East Midlands is the perfect place to undertake your Foundation Training. A two year linked scheme and geographically close facilities give you stability while you train and a high quality programme gives you broad experience in a range of different areas and locations. You'll also be able to enjoy everything the East Midlands can offer, from world-class sport to a thriving live music scene. And, with house prices 62% lower than London and the capital just over an hour away by train you're conveniently located to visit family and friends. When you come to the East Midlands for your Foundation Training you'll benefit from a two year linked programme. With rotations carefully designed to include geographically close locations you'll benefit from a range of experiences without needing to move home. You'll also benefit from dedicated careers support and the choice of a suite of courses that match your career aspirations, including surgical skills, paediatric life support and teaching skills. The East Midlands contains two of England's top ten cities and one of the country's major trauma centres. With two of the UK's top 25 Universities here also, it's the perfect place to develop your career. 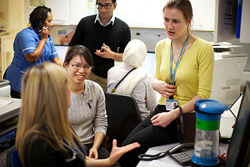 Once your Foundation Training is complete you will have plenty of opportunity to continue your career, whether in medicine, general practice or another specialty. With internationally renowned experts, world-class facilities and superb research opportunities, the East Midlands offers everything you could need. Unlike many other regions of the UK, living and working in the East Midlands doesn't cost the earth. House prices are 62% lower than London and 44% lower than the South East and thanks to the superb transport network you're conveniently located to visit friends and family. London is just 67 minutes by train from Leicester while 90% of England's population live within two hours of Nottingham. Derby is England's most central city and with major motorways and East Midlands Airport on your doorstep it's easy to reach the rest of the UK and beyond. The region also boasts world-class concert venues, great nightlife, Michelin star restaurants, international sport and some of the country's most important heritage sites.